In 1990, Flo-Tec Industries Corporation purchased Samco Products, Inc. (established in 1970) and renamed the company Atmore Industries. Soon afterward the Atmore company took a new direction moving forward into more specialized areas for nonwoven materials such as filtration, industrial, medical, agricultural markets, furniture and bedding and continues to develop new products for the nonwoven industry. Our 92,000 square foot facility is located 45 miles northwest of Pensacola, FL or 50 miles northeast of Mobile, AL in the Atmore Industrial Park. We are proud to be part of the Atmore community for over 40 years and as our sign says, “Products Proudly Made in the USA“. Our team goal at Atmore is to provide products to our customers with superior quality, fast friendly service and competitive pricing. We want our name, our word and a hand shake to mean honesty and quality. We pioneered ultrasonic lamination for nonwovens. This technology uses no glues, adhesives or thread lines to produce multilayer composites. Frequency vibration creating heat, melt nonwoven material polymers together making a stronger, thicker and softer end material that has unlimited end uses. We started production of composite materials using ultrasonic lamination in 1973 and have literally produced millions of yards of composite material with this technology. It is one of our areas of expertise here at Atmore. We use this technology to create industry leading composites for our own products as well as developing products for our customers. We also have laminating equipment using hot melt glue. 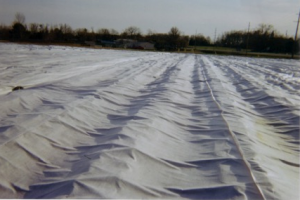 This process is used primarily for producing nonwoven agricultural products called floating row covers but can be used for other applications as well. We also have a number of rewinding/slitting machines to convert material to our customers specifications.